The reason why I got the two pots of freshly rendered duck fat the other day when I went to see the butter man was because I was there early enough to catch the volailler's duck wings, which usually sell out before 9:00. At less than 3 euros a kilo I was suddenly inspired. She always has her duck broken down into cuts which allows for very good deals on the less popular parts. It is a shame not to think of things to do with them. I'm ready for slow cooking today, spending some time organizing, preparing for the busy week ahead. Duck confit is very little hands on work. 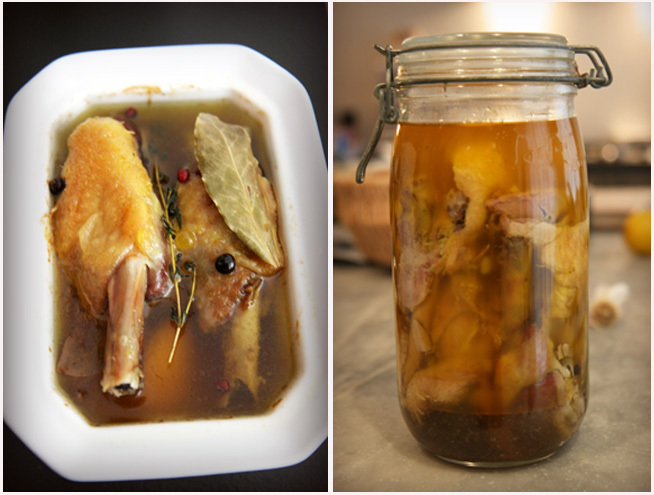 Slow cooking in multiple small terrines allows you to economize on the duck fat. You can also do this recipe with duck legs or using a whole duck, but I find the beauty of the whole thing the fact that it costs me less than 2 euros per serving using wings. I can go all out on some other part of a meal for guests or painlessly serve a group this way. They're delicious, trust me. Carefully check over the duck wings for leftover quill tips that might have been overlooked, and remove them. Rinse the duck wings, dry them, then salt them thoroughly. Rub it in, coat it on. Place the salted wings in a non-reactive bowl and keep in the refrigerator overnight. You can leave them in the salt for a second day, if you want. On the day that you will slow cook them, Set the oven to to 120C or 250F. Divide the duck fat into 4 terrines and place it in the oven to melt while the oven heats and you prepare the other ingredients. The duck fat is going to melt down and fill up about 1/3 of the terrine. You don't want more than this because filling it more will result in duck fat spilling over the edge when you add the duck wings. Rinse the duck wings thoroughly and dry them carefully. Get the bay leaves, peel the garlic, and measure the spices. 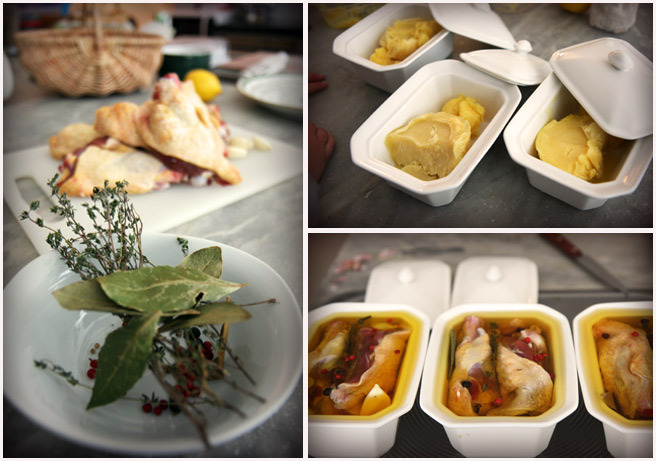 When the duck fat has reached 80C or 175F, slide the duck wings in with the fat along with the leaves, berries and spices. Cover the terrines and place them back in the oven to slow cook for 2 1/2 hours. Once the duck wings are done, that is tender, soft, and aromatic, meat retracted down the bone, garlic turned to a pretty caramel brown, remove them from the fat with tongs and place them on a grill to drain. Filter the fat with a screen strainer, and then nestle the wings into a tall jar to re-cover with the filtered fat. If you use a tall jar, the fat you have will cover the duck wings by about an inch. If you place them in a wider receptacle, you may not have enough duck fat to cover them for long term storage. Heat treat according to your jar manufacturer instruction if you want to save these for a long time. Otherwise, you can keep them in the refrigerator to use in the next few weeks. In all likelyhood you'll find yourself devouring the lot in short order either browned with a classic plate of parsleyed potatoes which have been cooked in a bit of of fat from the terrine, or for a low carb alternative, shredded and browned in a flat pan then spread luxuriously on an escarole or winter greens salad served with a garlicky anchovy-salted sherry vinaigrette, the lot sprinkled with grilled pine nuts and walnuts. Lucy, these look incredible. It's been so exciting to follow your most recent adventures! Thanks, Meg. I am wearing in the new kitchen, feels pretty good. Ah, I find it just crazy that the US is a country of such abundance and yet I can't get my hands on reasonably-priced duck. I do love confit. Thank you for the vicarious pleasure. My pleasure, Lori. You could do this with any kind of poultry, like for instance turkey or rabbit if you have access to that, or even chicken. I really meant it when I said I was coming to check out this new establishment! These look delicious! I've been craving duck recently, but like Lori said, it's so hard to find here. I'm going to have to try this with turkey instead. However, getting my hands on a pound of turkey fat might be kind of difficult, as well. Sure do wish I were in Lyon! Thanks so much for sharing. Lucy, why use so much fat? Just curious because I have not seen this before. Are the wings greasy or oily when they are cooked? I assume not, because that would ruin the dish. It seems the wings cook in the fat as if the fat were stock. Very interesting - and they look good!! I think I've died and gone to food heaven. The food looks great, of course, but my eye is drawn to those porcelain terrines... so gorgeous! I've got a great duck lady too. I'm going to try your recipe. It look fantastic.